How do I sew the Rick Rack on? What stitch would you recommend? I looked at some sites and some suggest a decorative stitch down the center (which I don't want to do with this particular quilt). My concern is the edges curling with time, or is that the nature of the beast? Do I apply it now while it's still a flimsy or after it's sandwiched? Just taking the rick rack beyond the edges and catching the ends when I bind? All the quilting will be linear, stitch in the ditch. I usually use a LA person for quilting but this one is small enough 40"X48" I will be attempting my first time quilting on my Viking Husquvarna 1+. I've quilted table toppers stitch in the ditch but nothing quite this big. I haven't really applied rick rack, but I did see something - maybe Martha's Sewing Room Show, don't know. Any way the rick rack was added using a zig zag. The zig caught the indentation on one side, the zag caught the indentation on the other. It really looked good and I am sure it would stay straight forever. I suppose to get the zig and zag right would take a little practice, but once the length and width were right, would be an easy application. 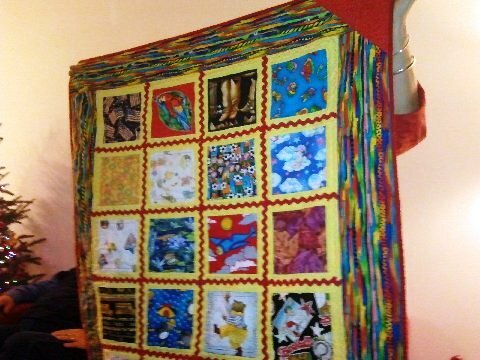 I recently finished this I Spy quilt for a nephew (wish the picture taker had made it better) and used rickrack on it. I used a straight stitch through the middle of the rickrack and let it curl later, yes, as it's prone to do. Babies and "littles" like 'playing' with it like that - a tactile thing. I inserted into a seam allowance and pressed that seam away from the rickrack. I applied it before I made the quilt sandwich and skipped over it when I quilted the whole. Your little one will like the quilt no matter, I'm sure! I always apply Rick Rack so that the ends go into a seam. If you are worried about it curling I wouldst right stitch down the center of the Rack Rack but following the zig zags. If you were just doing a small section it wouldn't take too long to change directions for each angle. if you are using the jumbo rick rack and want to be sure they stay looking like waves, i'd do a long but narrow zig zag stitch along both edges. but, like the others have said, the little 'uns like the tactile of the curled edges... so sew down the middle. it really depends how you want your quilt to look. I agree with everyone, it is your choice whether you want it loose so the baby can play with the edges or big zigzag so it lays flat. I would use matching thread tho!!!! I didn't have a lot of juvenile fabrics and since the rest of it is just patch work I'm hoping it looks boyish enough. Last edited by onaemtnest; 05-14-2013 at 09:26 AM. I was interested in this too. I have a quilt top somewhere that I plan to add jumbo rick rack to over every seam. Thanks. When I use jumbo rickrack I laborously go over every edge of it - top and bottom. I use the FMQ foot to do this. For smaller RR I zig down the middle then try to catch it in the quilting if necessary. I use matching thread color to sew it down, but the quilting may be done in a different color. Mine gets sewn on the top - before it's quilted. I don't usually quilt over it, but I have done so when I thought it needed tacked down a little more. Last edited by JanTx; 05-14-2013 at 12:49 PM. I kind of agree with you JanTx that I wondered if I would regret not sewing down the edges of the jumbo as it might curl too much. But I do like the idea of the smaller letting it curl on some projects. Here's a link to her video on youtube on how to make one of kind capris from your jeans in case anyone is interested. Last edited by onaemtnest; 05-14-2013 at 02:17 PM. The pictures of your baby quilts are adorable, thank-you for sharing pictures of them. I would recommend shrinking it before using it. Just soak it in very hot water for an hour or so and let it drip dry - or roll it up in a towel and let it air dry. I've had it shrink - - - and I didn't like the puckered look it created.